Managerial cost accounting is the financial and managerial tool that is used to estimate the organizational cost of products and services in business and government. In recent decades, cost accounting in the United States and other advanced industrial countries has been dominated by discussions of Activity Based Costing or ABC. While ABC can be shown to produce a more accurate estimate of cost than older and more basic types of cost accounting, ABC is not used extensively in many governments. We argue that this recent focus on ABC has stifled examination and discussion of how government cost accounting is being used and how it could be used in practice. 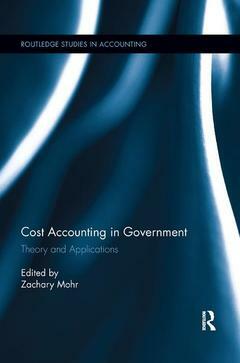 The study of cost accounting practice reveals an important and underexplored area of financial management in government. Given the scandals that cost accounting estimates can create and that different types of cost accounting can create different estimates of cost it may be reasonable to ask whether the cost accounting exercise is worth it? Cost Accounting in Government: Theory and Applications addresses these unusual and unusually important topics through a series of studies of different government cost accounting practices. The first section of the book presents two chapters on the history and basic elements of cost accounting. The second section of the book provides further discussion and case studies of actual cost accounting practices in the main areas that cost accounting has been used in government: benchmarking the performance of government services, rate setting, grant overhead cost recovery, and cost management. The last two chapters discuss cost accounting practices in Europe and the future of cost accounting. ?These cases span local and federal governments and provide a much needed context to the study of cost accounting in government.